They say that everything which was once old is now new again and that has never been more the case than with the world of design. Retail is all about chasing the newest trends: the constant need to be cutting-edge, to be one step ahead of your competitors and surprise your customers with something that really stands out of the crowd. Many people may underestimate the role that packaging really plays in the mind of consumers, but it’s important to always remember the importance of a good first impression. Now that Online shops are rapidly competing with brick-and-mortar stores, it’s never been more important to be able to catch your buyer’s eye in the smallest amount of time and space as possible. When it comes to packaging, long gone are the days of overly decorated and disorderly boxes, bags, and wrappers. The trend is overwhelmingly moving toward the realm of minimalism and understated style. Ultimately it is both the consumers and the retailers who benefit from simple packaging. This is the realm where form meets function in a style that proves it doesn’t have to fall on excess to be luxurious. So what’s wrong with a little excess? Well, as with everything in life, a little bit of something decadent won’t hurt you but it is easy to go overboard. When it comes to packaging, up until recently the trend was to be as lavish as possible with decorations. Every blank space was covered in elaborate logos, the brand names and catchphrases plastered on all surfaces, and the overall impact was to overtly display a product’s name. This was intended to sell an upscale image to the customers. This was a good idea in theory, but in reality too many embellishments on packaging created visual confusion. Your customers’ eyes would rapidly scan over the whole piece, unsure of what to focus on. At best, the effect was overdone and many of the finer details were lost. At worst, it caused the branding to become muddled and blend in with a sea of products with similarly chaotic packaging. Think of your packaging like a signature: it is something that’s unique and used to quickly identify who this item belongs to. The similarities don’t just stop there: your packaging also needs to be clear, concise, and immediately recognisable. This is where the trend for minimalism shines. A simple, streamlined layout not only prevents any confusion about who made the product, it also gives a clear message of what your brand is about. 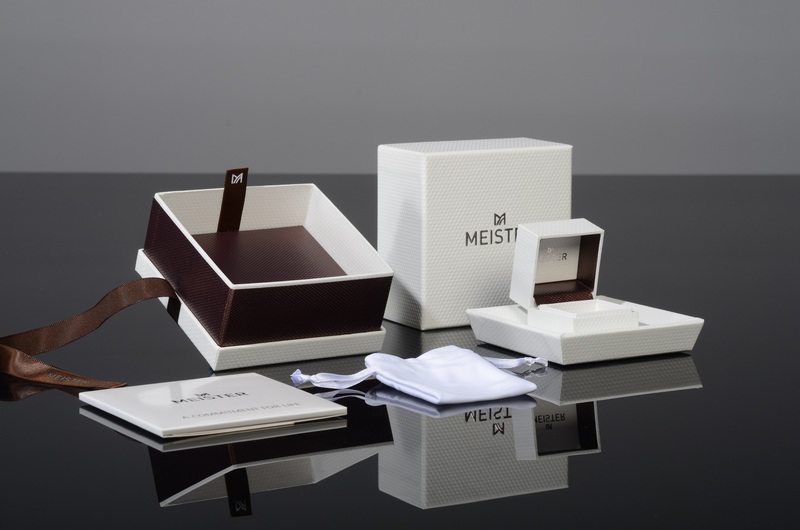 This is why you will see more and more luxury packaging services using a very traditional and simplistic three-shade schema: one light neutral, one dark contrast, and a pop of intense colour. This minimalist style draws all the attention to your brand’s logo and quickly tells the customers all they need to know about you: who you are and what you represent. No frills needed. This is not to say that the near-monochrome palette is the only option to dive into the minimalist trend. The well-placed and thoughtfully considered use of florals or patterns can bring a surprising sense of balance to a neutral background as long as they are used in moderation. A popular way to add this to packaging is by adding a bright piece of ribbon woven through the straps and tied into a bow. Alternatively you could opt for a cloth lining, which offers an unexpected flash of colour when the bag is opened. In these cases the subtle patterns and bold accents add a beautiful and elegant “hand-made” touch that in no way distracts from the brand’s messaging. There is a steadily growing awareness that going green is the way of the future. One thing that every company needs to consider at all times is how eco-friendly their operations are. More and more businesses are looking at the manufacturers of their supplies for ways to lessen their carbon footprint. other, less environmentally-friendly options. A good example of this is with high quality recycled paper which is often available at the same price as virgin paper or sometimes even slightly less expensive. The movement in luxury packaging towards minimalism is fuelled by a steadily-growing appreciation for simple chic. Long gone are the days of excessively ornate decorations and in-your-face messages. Instead, they’re being replaced by a calm and thoughtful elegance where the focus is on uniqueness. This trend has a lot to offer to luxury designers because the retail packing now becomes part of their branding itself. A bag or a box is now part of their signature: something that can create instant association with them without the logo even needing to be seen.